Can u plz tell me where u got the floor cushions? or were they custom? Can you please tell me where I can order these floor pillows? What is the fabric for the window covering? Does anyone know the fabric? Would love to know - thanks! Cushion - Where can I source the floor cushion? wondering if you ever found the cushions? what is the name of the carpet please? Anyone know the type of carpet on the floor here? Thnx! how did you d the walls? i know there are two paterns so how did you do both? Discontinued wallpaper - I love this wallpaper but I just found out that this particular color of jangala rose is discontinued. Does anyone know if it's possible to buy a small amount (for one small wall)? If so, where would I look for this? Thanks very much. Need help with the chair - Where can I get this chair? Thanks! Where can I get that lamp? what is the source for this dresser? 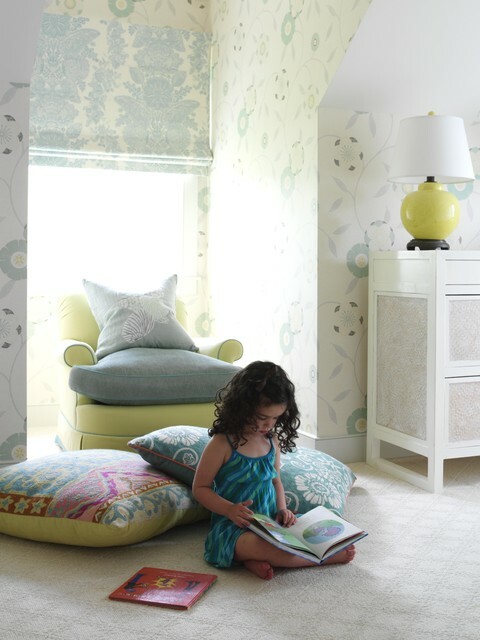 Revamp a kid's space with a mix of patterns and coordinating colors. The accent chair with contrasting seat and welting makes a traditional piece a bit more playful and kid-friendly. If you're looking to create a serene mood in your little one's space, opt for a calming color palette like the one pictured here. The soft blues and greens add just the right amount of color to this little reading nook. Osborne & Lily wallpaper... playroom?